‘Probably the most comfortable 1-0 you will ever see’ was how Westfield Football Club manager Jack Stapley described his team’s victory on Saturday. A first half goal from defender Martyn Durrant gave Westfield victory away to Selsey II and set up a second round meeting with Hollington United in the Sussex Intermediate Challenge Cup. 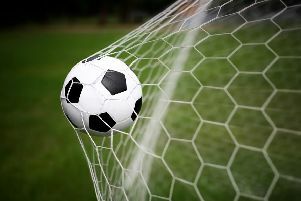 As it was, one was enough for a Westfield side lying fifth in Macron Store Southern Combination Football League Division Two against a Selsey team which has lost its opening three Reserve Section matches. Durrant got it after 20 minutes, heading home a Sam Ellis corner from six yards at the far post. Durrant could have had a hat-trick, as might fellow centre-half Lewis McGuigan, and Callum Smith also had chances in a game which Stapley felt Westfield should have had won after the first 10 minutes. There was one comical moment when Westfield hit the crossbar from a corner and as the ball dropped down, Selsey’s attempted clearance hit a Westfield player and rebounded against the crossbar again. At the other end, Westfield defended well to keep a second successive clean sheet on a soaking wet pitch and with the wind blowing hard. Sixteen-year-old Josh Barrett had a really good game on his first start, Zak Hurst performed well at left-back and Durrant also caught the eye. “We had so many young players on the pitch so it gave them some experience and showed we’ve got a bit of depth,” added Stapley. Westfield: Holland; J. Harris, McGuigan, Durrant, Hurst; Ward, Barrett, Ellis; Coombes (Stapley), Smith, Adams. A far stiffer test lies in prospect for Westfield as they make another long trip to Bosham in the league this coming Saturday. Table-topping Bosham have won their opening five league matches, scoring 29 goals and conceding five. “It’s a really tough test down there, but I think we’re hitting a little bit of form,” added Stapley. Josh Carey, Tony Harris and Connor Holland are all likely to be unavailable, but Stapley hopes to bring in a couple of players on loan from Tunbridge Wells, including a goalkeeper.